Johnny Cash fell into a ring of fire and so did these fruits! Fruits are an important part of your diet. They are a source of vitamins and it is a good idea to make sure you eat plenty of fresh fruit. Fruits are also an important part of casino games! They have long featured in slot games both online and in real casinos (standing slot machines). By no means is this a revolutionary slot game from Novomatic. It might be new but it won’t be anything you haven’t seen before. Red Hot Fruits has 5 reels and they are spinning fruits, fruits, and more fruits! On the reels you’ll also see some other recognisable symbols, such as the star and the seven. There’s nothing unusual about the way this slot game works. It has paylines, 25 of them in fact, that forge their paths across the reels from the left towards the right. The paylines are set so you can’t deactivate any of them. That doesn’t mean there’s a set wager, you can easily adjust your bet per line to increase or decrease your total bet per spin. Red Hot Fruits is simple and uncomplicated. It’s just an ordinary slot with no fancy frills. There’s a Scatter symbol but no Free Games and no Wild symbol. Novomatic are known for making good fruity slots but they are even more famous for their world-class video slots. Players go crazy for: Dolphin’s Pearl Deluxe, Book of Ra, Lucky Lady’s Charm, Secret Elixir and Katana. In total, there are 8 symbols in this game. The cherries are the least valuable symbol. The cherries have payouts for x2, x3, x4 and x5 matches. The other symbols to not have a payout for x2 matches, only x3, x4 and x5 combinations of the same symbol. The next most valuable symbol is the lemon, then the orange, the plum, the grapes, the watermelon, then the star and then the seven. The star is special because this is the Scatter symbol. The star awards its x3, x4 and x5 payouts from any position on the reels. The other symbols, however, are not Scatter symbols. These have to fall on paylines and on successive reels otherwise they won’t award their payouts. As the paylines pay one way, this means that the matching symbols have to fall from the left. If three or more of the same symbols (or two or more in the case of the cherries) land on a payline on consecutive reels, starting from reel 1 on the far-left, you’ll be awarded the corresponding payout. Payouts are displayed on the paytable. Each win for each symbol is shown and the amounts you can see will be accurate. This is because the paytable updates these values automatically when you adjust your bet. Novomatic is famous for making excellent slot games, fruity ones and unique ones. They’re also famous for adding their signature features to them. 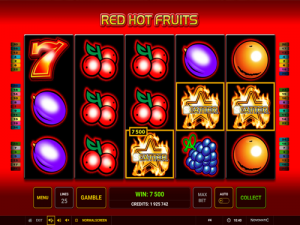 In Red Hot Fruits, you’ll find both the Gamble and the Autoplay extra features. You can use these to enhance your experience of the game and many players love them. Sick of clicking? Put the game in autoplay! Want to add some extra risk and make things more interesting? Hit ‘Gamble’ after a win! In other respects, Novomatic is famous for making great jackpot games! Some of their jackpot slots are progressive and others have fixed jackpot amounts. There’s a Novomatic jackpot slot to suit any sort of player as they’re built on lots of different themes. Fruity jackpot slots include: Amazing Fruits, Fruits n Sevens Deluxe, Jolly Fruits and Fruit Fortune. Other more uniquely-themed jackpot slots include: Wizard of Odds, Alchemist’s Secret, Elven Princess, Age of Privateers, Rumble in the Jungle, Monkey’s Millions, Kingdom of Legends, Frogs Fairy Tale and Cops n Robbers Millionaires Row. Give these a go if you’re feeling like something more adventurous than Red Hot Fruits. It’s always exciting to be playing for a jackpot, especially when it’s a big prize pot! Read our reviews to see the best online casinos where you can play these epic Novomatic jackpot slots.